Schatten uit de Musea: Nemea is voorlopig gesloten! Van 1971 tot 2004 hebben de Amerikaanse archeologen opgravingen verricht in Nemea en een keur aan gebouwen maar ook aan voorwerpen uitgegraven. Men zou dus verwachten dat al deze inspanningen beloond werden maar niets is minder waar. Sinds december 2017 hangt er een bordje aan het toegangshek met de boodschap dat de site en het museum gesloten zijn wegens een tekort aan bewakingspersoneel. Niet te geloven, toch? De geïnteresseerde toerist komt er bekaaid van af maar heel waarschijnlijk kunnen de illegale verzamelaars er intussen wel vrij hun gang gaan, denk ik dan? Today was a bright, sunny day with temperatures around 12oC. I decided to go for a walk to the museum, about 15 minutes distant from the office. 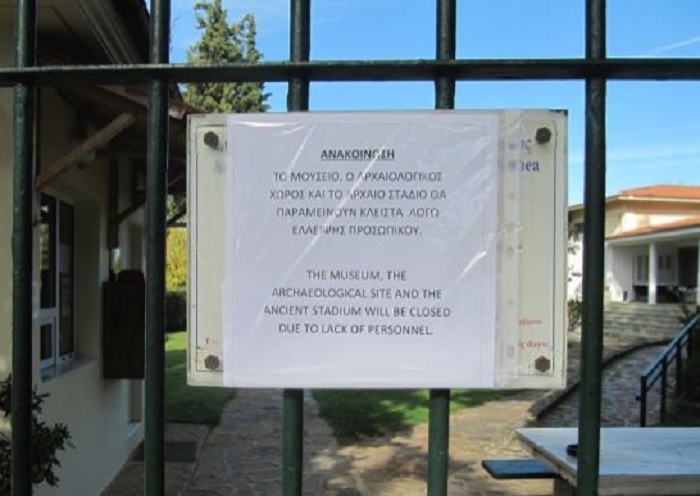 It was wonderful, but when I arrived the museum and the archaeological site were closed as they have been since November 23. 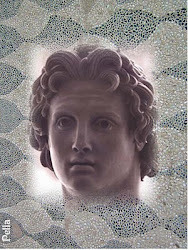 There were two rented cars in the parking lot, and eight people looking over the fence at the Temple of Nemean Zeus. They were two families with a husband and wife and two teenage children each. It emerged that they were neighbors from Santa Cruz, California, and that one of the wives had been a student at the University of California at Berkeley while I was still actively teaching there. She had heard about my work at Nemea then, and had managed to persuade her husband, and then her neighbors, to come to Greece during the Christmas break this year with a visit to Nemea as the highlight. They were all very disappointed that Nemea was closed and asked me how that had happened. I tried to explain that, at least for the last 50 years, the Greek state had decided that tourists only came to Greece for the island beaches in the summer months. Hence, at least in the recent past, a very small crew of guards was on duty for the whole year, and supplemental guards hired from April until October. I confessed that I did not understand why 17 additional staff was added at Nemea for those seven months, when 12 would have been adequate and the other five kept for the winter when the site closes at 3 p.m. shortly before the sun goes down. During the summer it is open for an additional 4-5 hours which requires more personnel. 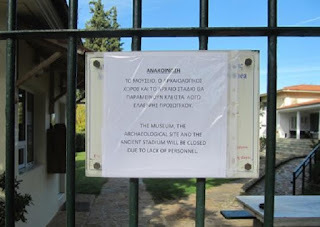 I also found it difficult to explain why, in 2016, our Society for the Revival of the Nemean Games was allowed to pay for four extra guards for the first four months which netted nearly €11,000 in ticket sales for the Ministry of Culture, but this year our written offer, supported by the local archaeological office, has been ignored. At this point one of the men pulled out a guide book, opened it and asked if I knew Stephen Miller. I admitted that I am Stephen Miller and that I had, since 1973, created the archaeological site of Nemea, constructed and equipped the museum, discovered the stadium with its vaulted entrance tunnel (which I subsequently consolidated), reconstructed several columns of the temple, planted trees and grass and flowers, fenced the whole area, and carried out maintenance such as painting and cutting weeds, especially in the stadium. I had also published many of my discoveries, some in guide books that are locked away inside the museum. I am now very frustrated that my discoveries were not being shared with visitors. The Ministry of Culture seems uninterested in the pedagogical aspects of ancient Greece. They asked me about the story of the discovery of the starting line in 1974 after 12 weeks of excavation without any sign of previous human life in the emerging earth. That happened on our last day of excavation, Friday, July 19, 1974. I explained the joy we felt, which was turned upside the next day when Cyprus was invaded. One of the boys asked if there was any way to get into the stadium. He had been looking forward to standing on the ancient line like ancient Greek athlete. Again I apologized that my discoveries were locked away. I also explained that everything I have done at Nemea has been done with funds raised from private donors, mostly Americans of non-Greek ancestry. In fact, two of the seven marble plaques with their names could be seen in the distance behind the locked entrance gate. I had persuaded those people to invest in Greece, and now their investment is wasted. So is mine. We shook hands and said good-by, and I expressed the hope that they might come back. Surely Nemea will open again someday. One of the mothers noted that the holiday period is best for all of their families to come to Greece. She was surprised that Greece did not understand that.